IRVINE, Calif. /California Newswire/ — 5 BARS(R), a premier provider of wireless solutions, set a new record for any single-day wireless data usage event on the Wi-Fi system installed and operating at NRG Stadium. During Super Bowl LI, the Wi-Fi system recorded data usage of 12.2 TB, exceeding last year’s record from Levi Stadium. Overall data usage exceeded 40 TB when cellular data usage is included. Verizon reported a 57% increase over last year with 11 terabytes of cellular data usage. AT&T reported an 88% increase to 9.8 terabytes. Sprint reported a three-fold increase to 5.0 terabytes. T-Mobile reported data usage nearly twice as much as usual, with 2.1 terabytes reported last year. 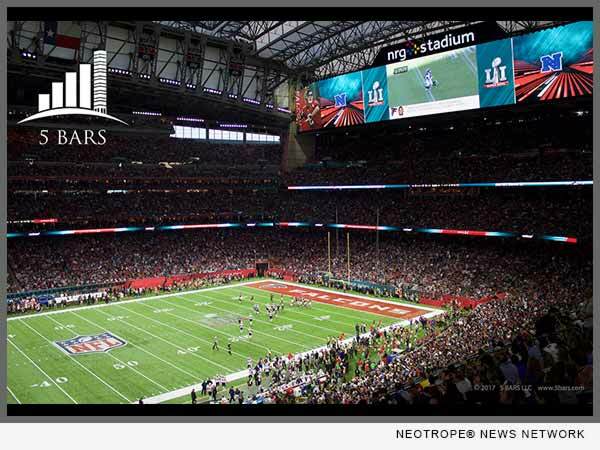 5 Bars worked with the NFL, Verizon, Super Bowl Host Committee, Harris County Sports & Convention Corporation and SMG to plan, design and build the technologically advanced high density Wi-Fi network to support the specific needs of the sellout crowd at NRG Stadium for the 2017 Super Bowl. Connectivity was the top priority to ensure maximum fan interaction during the big game. “We are beyond pleased with the performance of the network 5 Bars delivered to NRG Stadium on Sunday. The day was filled with new records and unexpected outcomes, and we are so proud to be a part of history,” said Monnie McGaffigan, President of 5 Bars. “The partnership and team work involved to bring a state of the art Wi-Fi network and exceptional experience to 77,000 fans was nothing short of herculean,” declared McGaffigan. 5 Bars is an Irvine, California based, privately held premier provider of Wireless Master Plans for Counties, Cities and Large Scale Venues developing comprehensive wireless strategies through a unique holistic view of all assets, coverage and capacity. 5 Bars offers fully managed wireless solutions, network development, ownership and end-to-end management delivering commercial indoor and outdoor distributed antenna systems (DAS), carrier-grade Wi-Fi networks, and small cell systems on behalf of properties and service providers. For more information visit http://www.5bars.com/.